That is the title of an article by Jay Weatherill as we suffered the recent heatwave. He believes that electricity supply is a public good and should be in public hands. However, the article is really a plea to Malcolm Turnbull to keep an emissions intensity scheme (EIS) on the table. In Climate clippings 175, Item 4, I made reference to the Bloomberg New energy outlook, 2016 report which identifies eight “massive” shifts coming soon to power markets. In this post I’d like to take a closer look. 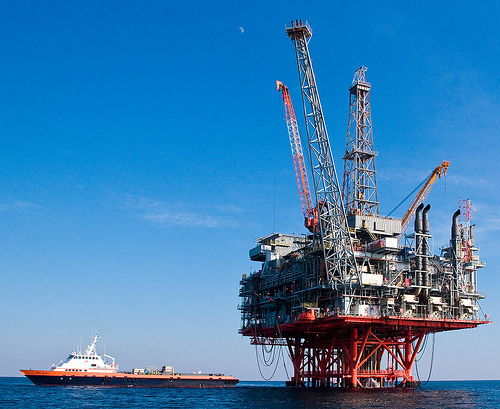 Big Oil’s business model – broken? Michael T Klare in an article at Grist claims that Big Oil’s business model is broken. I’m not so sure. An IEA (International Energy Association) update which he cites is titled A business-as-unusual outlook for oil in the medium term. 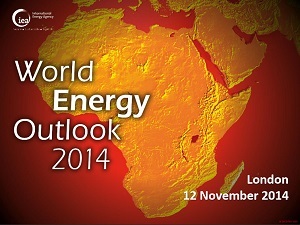 Certainly there have been changes since the IEA’s World Energy Outlook 2014 (see my recent post). Last September in the Outlook document the IEA saw oil prices rebounding, averaging $82.50 a barrel in 2015 and rising to near $100 in the coming years. Now they see prices recovering gradually to reach $73 a barrel in 2020. The IEA now sees production as increasing by 5.2 million barrels per day over the same time period, which is substantially the same as forecast last September. Emerging economies are reaching a less oil intensive stage of development. The global economy is becoming less fuel intensive. Concerns over climate change are affecting policies, for example the fuel economy regulations for motor vehicles in the US, which Klare says will reduce demand by 2.2 million barrels per day by 20125. Globalisation of the natural gas market and the emergence of renewable technologies has led to inter-fuel competition beyond what would have been expected only a few years ago. North American unconventional production (light tight oil, or LTO) has been greater than expected and has become the top source of incremental supply. Iraq supply increase is also beyond expectations. Klare’s major point is that the oil industry assumed that demand would continue unabated no matter what the price, leading to massive investment in what he calls “tight oil” – oil from unconventional, hard to get at sources. 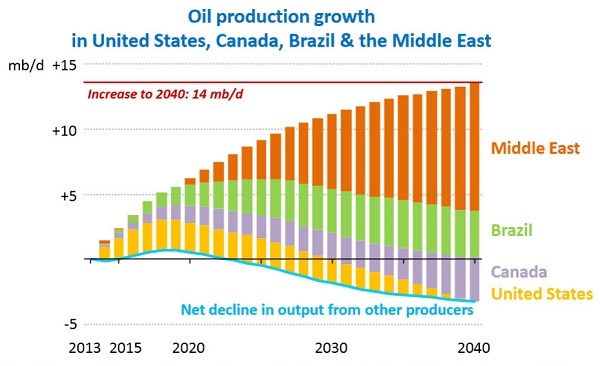 His thesis is that production and consumption will increase, but only slowly, and to an extent and at a price that will not justify the investment necessary to extract tight oil. 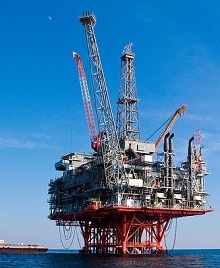 The investment in tight oil dates from 2005, when production was 85.1 million barrels per day. At that time the IEA forecast that demand would reach 103.2 million barrels per day in 2015. In 2014 it was 92.9 with the forecast for 2015 only 93.2. Such figures fall far below what would be needed to justify continued investment in and exploitation of tough-oil options like Canadian tar sands, Arctic oil, and many shale projects. Indeed, the financial press is now full of reports on stalled or cancelled mega-energy projects. Shell, for example, announced in January that it had abandoned plans for a $6.5 billion petrochemical plant in Qatar, citing “the current economic climate prevailing in the energy industry.” At the same time, Chevron shelved its plan to drill in the Arctic waters of the Beaufort Sea, while Norway’s Statoil turned its back on drilling in Greenland. In that sense Klare is right. Also profits like $32.6 billion in 2013 for Exxon (second only to Apple) and $21.4 billion for Chevron are unlikely to continue. Nevertheless these firms are not out of business. Some of the smaller producers in the sense of firms and countries may be, leading to possible failed states and security concerns. Russia will be producing less. The bottom line, though, is that the crystal ball is clouded. Uncertainty prevails. The International Energy Agency estimates the planet is on track to warm by 3.6 degrees Celsius. Investment in renewables needs to quadruple to an average of $1.6 trillion every year through 2040 to meet the 2-degree target. 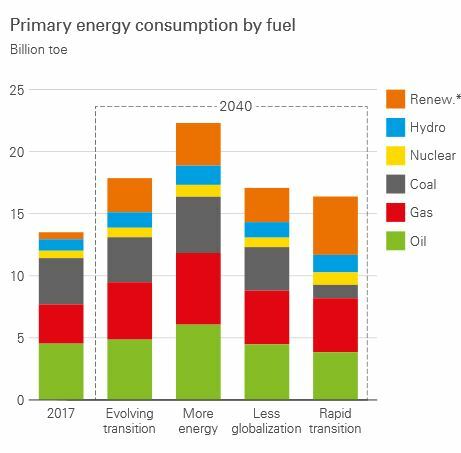 By 2040, the world’s energy supply mix will divide into four almost-equal parts: oil, gas, coal and low-carbon sources, including renewables, hydro and nuclear. 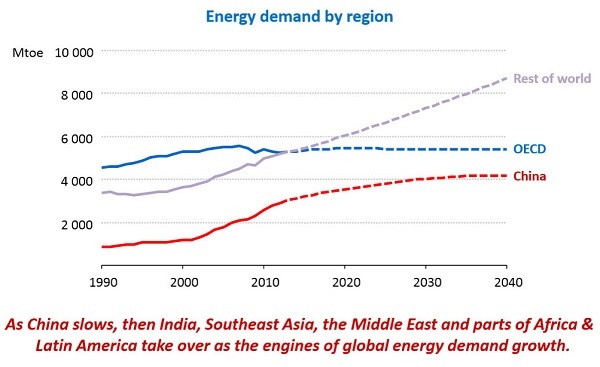 Growth in oil and coal will taper to nothing, but gas will grow vigorously, with demand increasing by 50% by 2040. Concern is expressed that ISIS is deterring investment in production in Iraq. Oil prices are likely to rebound, averaging $82.50 a barrel in 2015 and rising to near $100 in the coming years. 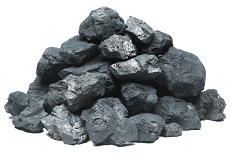 Global coal demand will grow by 15% to 2040, but almost two-thirds of the increase will occur over the next 10 years. 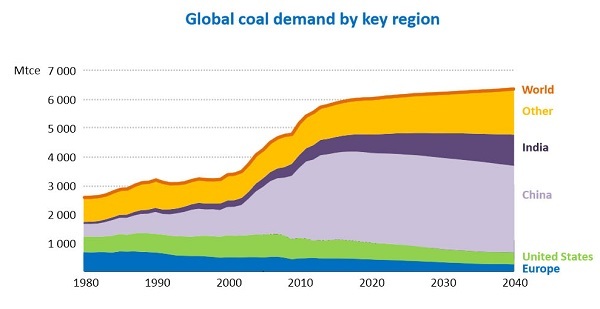 Chinese coal demand plateaus at just over 50% of global consumption, before falling back after 2030. Demand declines in the OECD, including the United States, where coal use for electricity generation plunges by more than one-third. India overtakes the United States as the world’s second-biggest coal consumer before 2020, and soon after surpasses China as the largest importer. Australia will pass Indonesia to once again become the largest exporter by 2030. 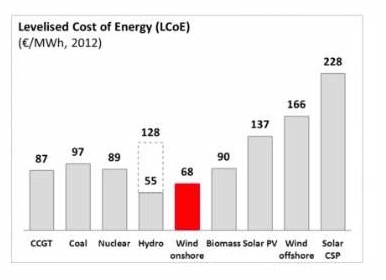 The graph also highlights the folly of India and developing countries polluting their way to prosperity. 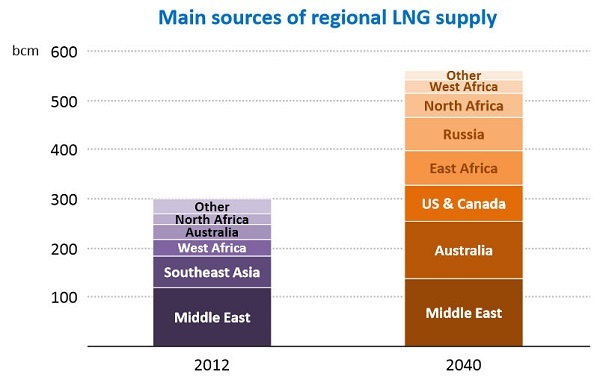 The key uncertainty – outside North America – is whether gas can be made available at prices that are attractive to consumers while still offering incentives for the necessary large capital-intensive investments in gas supply; this is an issue of domestic regulation in many of the emerging non-OECD markets, notably in India and across the Middle East, as well as a concern in international trade. 60% of gas will be ‘unconventional’, meaning shale and coal seam. There is uncertainty about the $900 billion per year in upstream oil and gas development needed by the 2030s to meet projected demand. 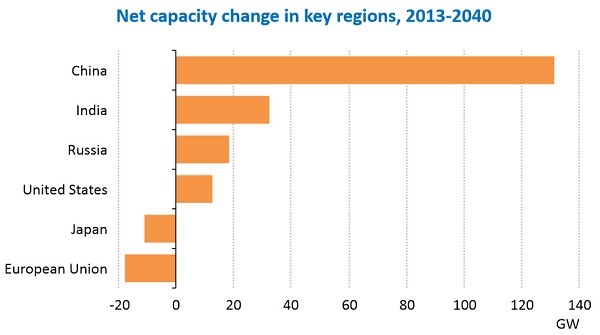 The IEA sees global nuclear power capacity increasing by almost 60%. However, its share of global electricity generation will rise by just one percentage point to 12%. 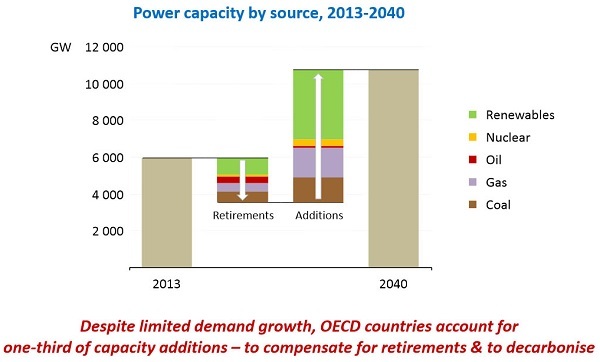 Renewables will account for almost half of the increase in total electricity generation to 2040. The share of renewables in power generation increases most in OECD countries, reaching 37%, and their growth is equivalent to the entire net increase in OECD electricity supply. However, generation from renewables grows more than twice as much in non-OECD countries, led by China, India, Latin America and Africa. Globally, wind power accounts for the largest share of growth in renewables-based generation (34%), followed by hydropower (30%) and solar technologies (18%). 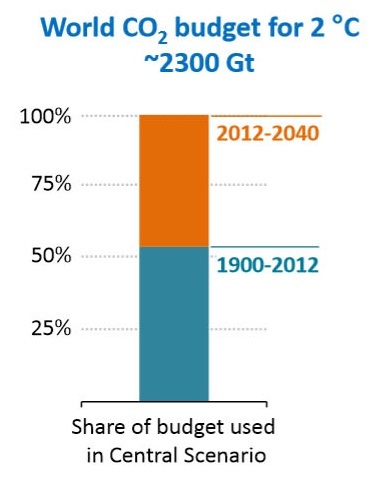 Global subsidies amount to $120 billion compared to $550 billion for fossil fuels. 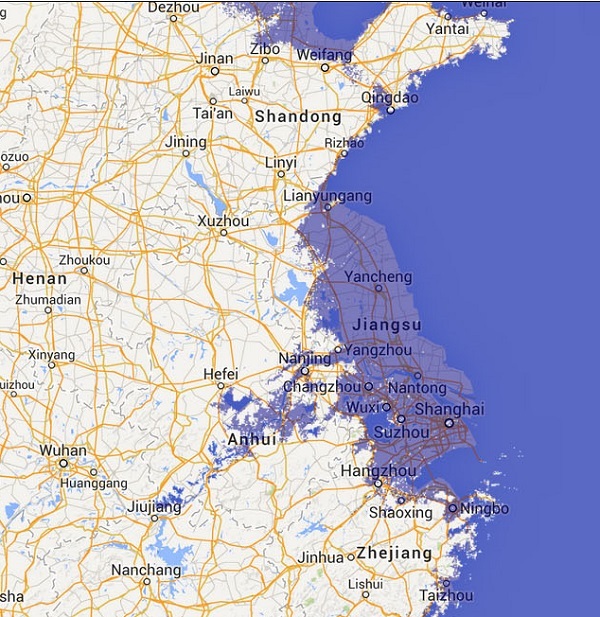 The growth in hydropower is an ecological concern. The Executive Summary leads with a statement about the uncertainty of energy futures in very troubled times, so the IEA forecasts must be seen in this light. The IEA is urging strong intervention by decision makers in the UNFCCC conference in Paris in December, to avoid a climate catastrophe. They call it the last chance. Worth noting here is that the 2011 World Energy Outlook found that all new power supply built after 2017 would need to be zero carbon. Clearly we are relying too much on gas and coal for new supply, and we need to retire more dirty power, especially brown coal. Unfortunately one can’t read the full report without buying it so I’ve had to make do with links, mostly from this page. The Executive Summary provides the story in words, the pictures all come from the London presentation. See also Peter Hannam at the SMH, my 2011 post on the 2011 report and Climate clippings 103, Item 4 for a brief treatment of World Energy Investment Outlook 2014. 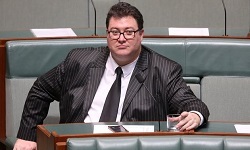 Also relevant is Mark Diesendorf’s plan for 100% renewable energy in Australia. Finally, BP has taken a look at the future. What they find is not dissimilar to the IEA, just heading down the crapper a bit faster. 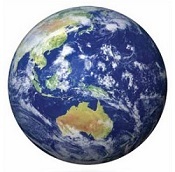 They see global energy consumption in 2035 as 37% greater than now and CO2 emissions 25% more. They see a clear role for themselves to make a buck while cooking the planet. 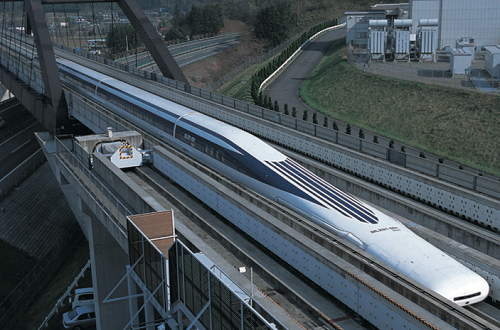 The Japanese have run an actual train with people in it at 500 km/h. The Chinese have built a train which can theoretically run at 1800 mph by encasing it in a vacuum tube. It looks as though high speed rail could become a real alternative to air for intercity travel. Thanks to John D for the headsup. The world’s first power-to-liquids (PtL) demonstration production plant was opened in Dresden on 14 November. The new rig uses PtL technology to transform water and CO2 to high-purity synthetic fuels (petrol, diesel, kerosene) with the aid of renewable electricity. The article does not say how efficient the process is, but presumably less so than using the electricity directly. No doubt this policy stems from the bank’s commissioned report Turning down the heat. Hope has been injected into the Climate Change Conference in Lima, Peru, scheduled to run from 1 to 12 December by the recent US/China agreement. The optimism stems as much from the fact that the two largest emitters in the world are finally working together as the level of ambition. The EU has also recently pledged to cut emissions by 40 percent from 1990 levels by 2030. Countries will be working on the text of the draft agreement for Paris in 2015. Countries are expected to put forward their contributions towards the 2015 agreement in the form of Intended Nationally Determined Contributions (INDCs) by the end of March . These will then be used to craft the Paris treaty. The Lima gathering will help provide guidelines and clarity for what these INDCs must entail, especially for developing countries still reliant on fossil fuels to meet fast-growing energy demand needed to achieve developmental goals. These options could range from sector-wide emissions cuts to energy intensity goals to renewable energy targets. We’ll be represented during the second week by Julie Bishop and Andrew Robb, a climate change denier. Seems Bishop went bananas when she found out, and Robb doesn’t want to be there anyway. Giles Parkinson reports that we’ve sent a delegation of 14, the smallest in 20 years and probably not enough to be actively obstructive as we were in Warsaw last year. 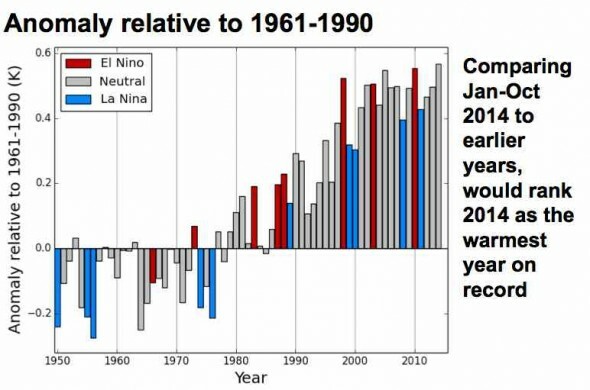 Record hot years are often El Niño years. This year is a neutral ENSO year so far. That’s so far; there is at least a 70% chance that El Niño will be declared in the coming months, according to the BOM. Looks like a hot, dry summer. E.ON will also focus on smart grids and distributed generation in an effort to improve energy efficiency and increase customer engagement and opportunity. “With its decision, E.ON is the first company to take the necessary steps from the completely changed world of energy supply,” German Economy Minister Sigmar Gabriel, said Monday. according to latest estimates, EU greenhouse gas emissions in 2013 fell by 1.8% compared to 2012 and reached the lowest levels since 1990. So not only is the EU well on track to reach the 2020 target, it is also well on track to overachieve it. The consumption-based emissions (i.e. where emissions associated with imports and exports are considered) of the EU 28 were 2% higher in 2008 than in 1990. By 2013 emissions had marginally reduced to 4% lower than 1990 – but not as a consequence of judicious climate change strategies, but rather the financial fallout of the bankers’ reckless greed – egged on by complicit governments and pliant regulation. In the quarter of a century since the first IPCC report we have achieved nothing of any significant merit relative to the scale of the climate challenge. All we have to show for our ongoing oratory is a burgeoning industry of bureaucrats, well meaning NGOs, academics and naysayers who collectively have overseen a 60+% rise in global emissions. This edition contains a miscellany from the absolutely central scientific issue of climate sensitivity to adaptation in Bangladesh. The fourth IPCC report in 2007 estimated that the planet will warm between 2 and 4.5°C warming in response to a doubling of the amount of CO2 in the atmosphere, with a best estimate of 3°C. Since then a number of studies suggested a lower sensitivity, leading the IPCC’s fifth report to extend the range to 1.5°C at the lower end and omit a best estimate entirely. Dana Nuccitelli reports on a new paper by Kummer & Dessler which shows that recent studies suggesting an insensitive climate are flawed. Without going into the detail they converge on a value around 3°C. Some contend that increased CO2 in the atmosphere will enhance plant growth leading to an increase in soil carbon. A study of this issue found that any such gains were offset by increased microbial activity in soils. 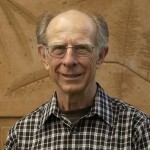 Along the way the researchers found that soil carbon was less stable than previously thought. 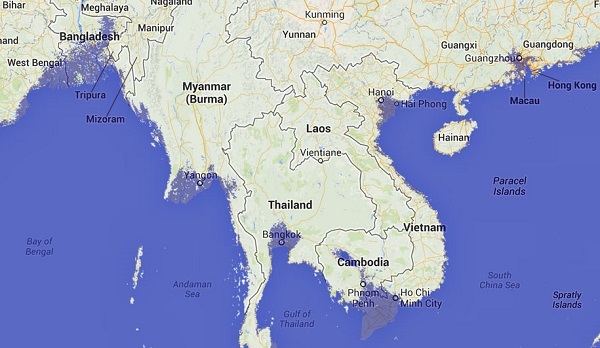 Bangladesh has found the cost of climate change adaptation quite crippling in a new report. They are spending $1 billion a year, 6-7% of their annual budget, on climate change adaptation. Only a quarter comes from aid. The irony of the finding will be lost on few people: the average European citizen emits as much carbon in 11 days as the average Bangladeshi in an entire year. Yet it is the government and the people of Bangladesh who are expected to pay for the escalating costs. Within the country it is the poor who are most severely affected. After the report Bangladesh sees climate adaptation expenditure as central to their development. said it would not finance an expansion without the assurance of both the Government and UNESCO that it would not damage the Great Barrier Reef. “We observe that there is no consensus between UNESCO and the Australian Government regarding the expansion of Abbot Point,” it said. Thanks to John Davidson for the heads-up. In Europe, that is according to Portugal’s EDP, which has around 24GW of generation, of which around 8.7GW is in onshore wind. John D has more detail at Climate Action 04. The same article tells us that Keith DeLacy, former Qld Labor treasurer who would do just about anything to turn a buck, said on the front page of the Oz that renewables had “no place in a modern society”. Put in real money, probably $20 to $30 billion I would say, minimum, to get scaled, serious demonstration programs working in China, in India, in Australia, in Canada, in the United States and to test the geology and the engineering of this technology. Sachs is a man who thinks big! Not surprisingly, the EU has been taking another look at its energy security strategy in view of the political instability to their east. The EU imports over half the energy it consumes at a cost of more than €1 billion per day. Two-thirds of its gas is imported, with nearly a third coming from Russia. Half of that is transported via Ukraine. Russia has already twice pulled the plug on gas supplies to Europe arriving via Ukraine, in 2006 and 2009. The EU energy security strategy doesn’t look like it’ll take a rifle to that Russian bear just yet. But with a tweak to address vulnerability here and a spotlight on energy dependence there it may just help the EU avoid a mauling – and drive an ambitious EU 2030 climate and energy deal too. Shale gas and nuclear energy are being left as options that member states can explore if they wish.